Around the stables, the spring greens became abundant in the last week or so. As I walked around today, I saw curly dock, dandelions, Japanese knotweed, wintercress, oregano, garlic mustard, and a few other greens I probably should be able to identify. Most of the greens had already flowered, making them bitter. But, today, I only had eyes for the nettles. This week they were easy to find. Tucked in the back, near the stream, mixed in with an awful lot of garlic mustard. They'd grown fairly high, so I only took the tips. When I was done snipping, I had a full grocery bagful. I thought maybe it was enough for 2 projects but it turns out I can get 3 separate meals out of them. Likely by next week the plants will be too far gone until the fall, so I'm making full use of what I picked! 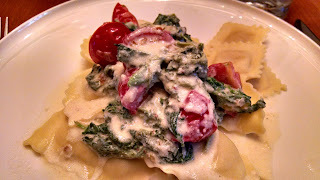 Tonight's dinner was sausage ravioli with a nettle and mascarpone sauce. I'd made this before, with spaghetti, but I much preferred tonight's version. Garlic and shallots were sautéed in butter and olive oil, then I added about half a cup of milk, 8 oz. of mascarpone cheese, blanched nettles, salt, pepper, nutmeg, quartered Campari tomatoes and Parmesan cheese. When the ravioli were ready the sauce was spooned over each serving. The dish was finished with a little more freshly ground nutmeg. The nettles went very well with the sausage and the whole thing just looked pretty. Tomorrow I plan to make a risotto. The third portion will likely be used to make some pasta, so for now it's in the freezer.